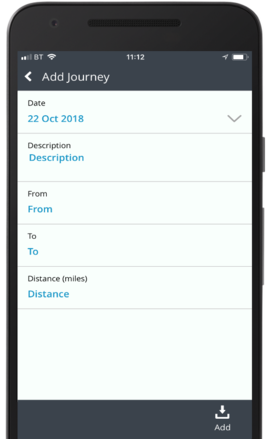 This article will explain how you can create a mileage claim on the mobile app if you pay for the fuel using a fuel card. 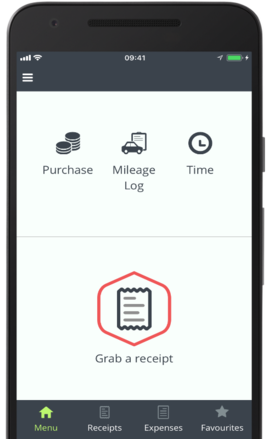 The mileage log has been designed for users who have a company vehicle. ExpenseIn is able to work out the private mileage which can then be deducted from your expenses or paid back to the employer. 4. You should enter the start odometer reading from your vehicle. Don't enter the end odometer reading yet as you will need to do this at the end of the month. 5. You can attach fuel receipts to your claim by tapping the receipt icon. 6. Tap the red Journey icon. 9. You should enter the From and To journeys. Click Add to add the journey to your log. You can remove, duplicate, or add a return for that journey by tapping the journey. 10. You can add more journeys to your log by clicking the red Journey icon. This will open up the Journey screen. Please note: You only need to create one log for each month. You will add all of your journeys throughout the month to this log. Once you have added your journeys for that session, you can click Save. The log will then reside in your Draft area where you can continue to add more journeys to it throughout the month. 11. 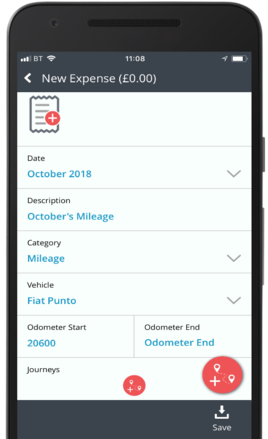 When you are ready to submit your mileage claim you should input your end odometer and click Save. 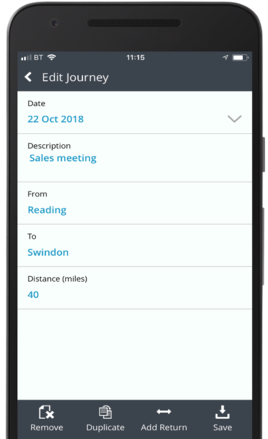 The system will look at the start and end odometer readings as well as the business journeys to calculate a negative value which will represent your private mileage.